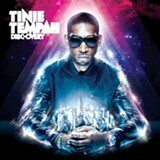 Seldom do cockney accents sound as good as they do on the recorded products of 22-year-old South London rapper Tinie Tempah. It's particularly charming when he's rhyming the word "pimple" with "wrinkle," or pronouncing "better" as "beh-uh." That said, there aren't enough quaint British sayings on Tempah's Capitol Records debut, which is a slightly altered version of the album that dropped in the UK back in October. (Hot bonus: Wiz Khalifa and R&B singer Bei Maejor both appear on the US iteration.) Accent notwithstanding, it tries to be flat, non-geographical, and dishearteningly un-English — if only to garner a wider audience abroad. Tempah runs the gamut of familiar hip-hop clichés — from male preening (he boasts about his congenitally flawless skin in "Simply Unstoppable"), to material wealth, to philandering. What stands out about Disc-Overy isn't the verbal content but the musicianship in Tempah's beats.